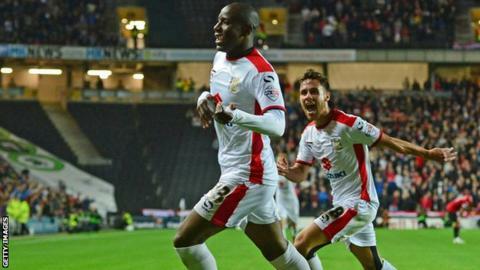 MK Dons beat Barnsley 5-3 despite a late comeback from the hosts who scored three goals in the final eight minutes. Benik Afobe and Samir Carruthers gave the Dons a two-goal half-time lead and Dele Alli, Will Grigg and Ben Reeves added to Barnsley's misery. But Conor Hourihane scored twice late on for the Tykes and Devante Cole added another to restore some respectability. The result moves MK Dons up to third in League One, while Danny Wilson's Barnsley are down to 13th. "I think we rode our luck in the first 10 minutes when we switched off from a set-piece. "To come in with five players out and to perform how we did is very very good. "It's a good performance by the group and the group are looking very strong. "Mark Randall was sensational today. It was his type of pitch, nice green grass. Hopefully he'll sign a long-term contract this week." Match ends, Barnsley 3, MK Dons 5. Second Half ends, Barnsley 3, MK Dons 5. Corner, MK Dons. Conceded by Reece Brown. Goal! Barnsley 3, MK Dons 5. Devante Cole (Barnsley) header from the centre of the box to the bottom left corner. Assisted by Dale Jennings with a cross following a corner. Corner, Barnsley. Conceded by George Baldock. Attempt saved. Sam Winnall (Barnsley) header from the left side of the six yard box is saved in the top centre of the goal. Hand ball by Mark Randall (MK Dons). Goal! Barnsley 2, MK Dons 5. Conor Hourihane (Barnsley) left footed shot from outside the box to the top right corner. Assisted by Dale Jennings with a cross. Corner, Barnsley. Conceded by Dean Bowditch. Corner, Barnsley. Conceded by Antony Kay. Attempt missed. Mark Randall (MK Dons) right footed shot from outside the box is close, but misses to the left. Attempt missed. Conor Hourihane (Barnsley) right footed shot from outside the box is too high. Goal! Barnsley 1, MK Dons 5. Conor Hourihane (Barnsley) left footed shot from outside the box to the top right corner. Assisted by Luke Berry. Goal! Barnsley 0, MK Dons 5. Ben Reeves (MK Dons) left footed shot from the centre of the box to the bottom left corner. Assisted by Daniel Powell. Substitution, MK Dons. Ben Reeves replaces Dele Alli because of an injury. Substitution, MK Dons. Tom Hitchcock replaces Samir Carruthers. Attempt missed. Sam Winnall (Barnsley) right footed shot from a difficult angle on the left is too high. Goal! Barnsley 0, MK Dons 4. William Grigg (MK Dons) right footed shot from the right side of the box to the bottom right corner. Attempt saved. Dele Alli (MK Dons) right footed shot from outside the box is saved in the centre of the goal. Substitution, Barnsley. Sam Winnall replaces Leroy Lita. Attempt missed. Reece Brown (Barnsley) right footed shot from a difficult angle on the left is high and wide to the left. Corner, MK Dons. Conceded by Joe Dudgeon. Substitution, Barnsley. Devante Cole replaces Kane Hemmings. Goal! Barnsley 0, MK Dons 3. Dele Alli (MK Dons) right footed shot from the centre of the box to the top right corner. Assisted by Samir Carruthers. Corner, MK Dons. Conceded by Martin Cranie. Joe Dudgeon (Barnsley) wins a free kick in the defensive half. Second Half begins Barnsley 0, MK Dons 2.